Car window tint laws in Louisiana were enacted in 1993. These Louisiana window tint laws are valid for 2019, and regulate how dark and reflective your car tint may be, but also specify other rules and regulations you need to know about. How dark can your window tint be in Louisiana? Window tint darkness is measured by Visible Light Transmission percentage (VLT%). In Louisiana this refers to the percent of visible light allowed in through both the film and the glass. Here's exactly how much VLT is allowed on your auto window tint in Louisiana (LA), categorized by sedans and SUVs and vans. How reflective can your window tint be in Louisiana? Similar to lenses on your sunglasses, tinting film may contain metallic elements which help in reflecting incoming light, thus reducing glare and heat generated by visible light. Below you can find out how much reflection is permitted on your car window tint by law in Louisiana. Restricted Colors: No colors of tint are explicitly banned in Louisiana. Certificate Requirements: Manufacturers of film must certify the film they sell in the state. Ask your dealer if they are using certified film. Sticker Requirements: The sticker to identify legal tinting is required between the film and glass on the driver’s side window. Medical Exemption: Louisiana law does NOT allow any medical exemptions that would allow you use special tint. 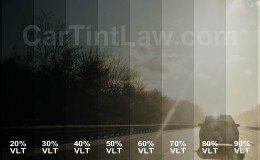 Remember that state tint laws may be differently interpreted by your local law authorities and we always recommend to check with them as well to make sure you are within 2019 Louisiana window tinting law, rules and regulations. Our article about Louisiana tint laws is up to date as of 2019. We double check all tint laws monthly to update with latest legislation. If our information is incorrect or incomplete please let us know. Thanks! Louisiana window tint laws are extracted from current Louisiana laws and statutes. Please review our sources and references for more information, or ask our partnered attorneys if you have further questions. More Louisiana traffic law questions?